Was I expecting much from this reboot,of Tobe Hooper's classic, well not really!! Was it any good? Well once again not really. I, at least thought it could have had a different edge to it,well it didn't,it became in the end a more or less shot for shot remake,just using up to date technology,instead of the old CRT Television screens we now have a 50" LCD,and we have a slightly creepier clown. It comes to something,even with better technology,and CGI effects,we can have a film made 24 plus years earlier with greater special effects,than this recent effort. The same thing was quoted online about the Nightmare On Elm Street scene 2010 with Freddy Krueger appearing over Nancy in the wall,using CGI looked crap,compared to the original version,using proper materials,and decent film making techniques. As a Horror blogger,and reviewer,it is my job to review,and watch as many films as possibly possible,but it is becoming increasingly difficult now,with the new influx of modern Horror,that is saturating the market,with below par efforts,with no originality,and the Hollywood machine,to remake and reboot popular classics,as they have no ideas themselves,and remaking them so badly. 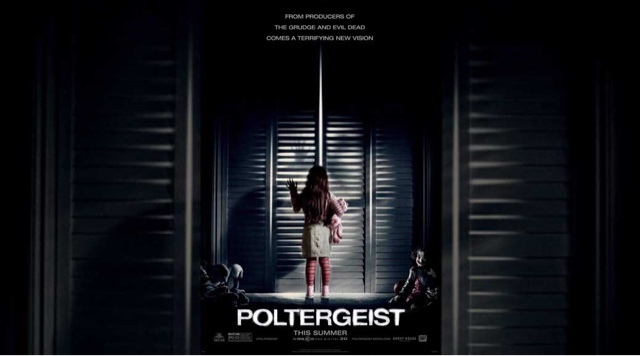 Is Poltergeist 2015 really bad, honestly no!! But it still could have been better,even still not being remade at all would have made better sense, yes it is well acted, I love Sam Rockwell,he is a very talented young actor. Even the dreadful Jared Harris,as a medium is not annoying. We still have a film,that didn't need to be made,and the world would be no worse off,not having this remake in its history either. A film personally I cannot recommend,I remember being scared shitless by the original,this remake is not in the same league,a poor remake,and definitely worthy of the low scores on all movie review sites.